As we begin a new year, it’s the time to think about starting new hobbies, resurrecting old ones or learning new skills. We have to put our hands up here at Crafty Bug HQ to say that sewing is not really in our skill set. Sewing on buttons, OK and shortening the odd pair of trousers (being somewhat “vertically challenged” that’s borne of necessity) are about as far as it goes. So with this in mind, we thought this year would be a good time to start learning some of the basics by pulling together some of the easiest to understand and to follow tutorials available. You never know, even more skilled sewers may find some new useful hints and tips to help them with their latest projects. beautifully filmed with multiple camera angles used including those all important close ups of detailed actions (such as threading the needle). We love the way in which Gretchen has her pincushion handily strapped to her wrist for ease of access. It’s such a great idea – you’re never without a pin or two to hand when undertaking a sewing project. 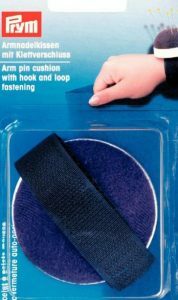 We recommend trying this wristband pincushion for the same effect. Who hasn’t wondered where to put their pins down safely so that you can find them again easily and not do yourself a mischief in the process? For anyone aspiring to take up sewing in some form, whether it be dressmaking, sewing accessories such as bags, toymaking or getting stuck into homewares such as cushions and throws, making friends with your sewing machine is essential and I hope the above video has helped allay any fears you might have had. If you are new to sewing, you will need a basic kit to get you started. As time goes on and you decide what sort of sewing projects you want to tackle, you will inevitably build up your own store of sewing accessories but you might like to take a look at the following video as a starting point. This video by The English Tailor walks you through the equipment you will need for your sewing projects and runs to just over 17 minutes in total. While it covers the basics and each item is shown to the viewer with an explanation, I didn’t find this as engaging as our first recommended video above. Nevertheless it is well worth a run through for the information given. One recommended accessory is a sleeve board, this being a mini ironing board to make ironing garment sleeves easier (my mother had one but this is not something I possess). If you aren’t planning to make clothes (or clothes with sleeves), then this is something you are unlikely to need so I wouldn’t recommend buying one at the beginner stage. You can, of course, always add this and other items as you experiment with your sewing and decide what you really enjoy making. I hope you have found these two videos interesting and feel inspired and all fired up to have a go at your own projects. In our next couple of posts, we will suggest some straightforward beginner projects which are easily achievable to get you started. If you have any great ideas for fun projects to inspire our readers, please get in touch by filling in the comments box below. For a great range of fabrics and all your sewing accessories, we recommend Minerva Crafts. Minerva is a family run business which has been trading since 1998 “borne out of a love for fabric, sewing and knitting” and they have an excellent reputation. With a huge range of products and excellent customer service, why not take a look at their website?